I base my infantry in battalions of 24 figures, with 12 figures on each of the two Big Bases. I have an officer, standard bearer and musician (usually a drummer) in each battalion. 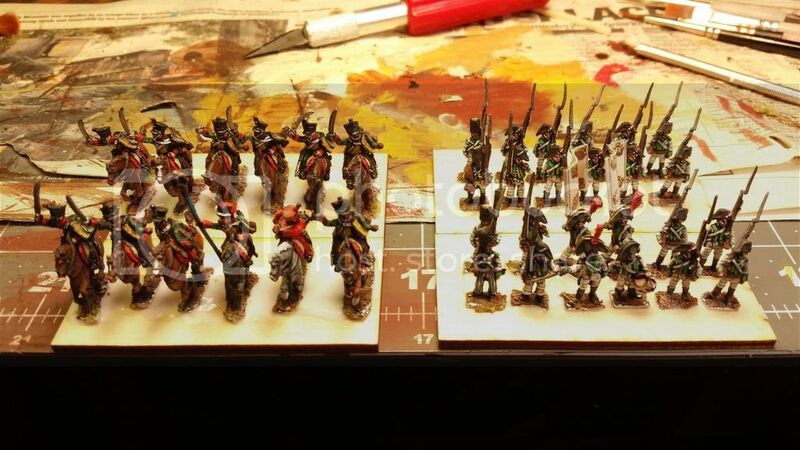 The rest of the figures are centre/fusilier, grenadiers and light/cazadore/voltigeurs. Grenadiers and light/cazadore/voltigeurs always have different uniforms to the centre company / fusiliers. The French battalions had six companies, four fusilier, a grenadier and a voltiguer. Apparently officers and standard bearers had white plumes. Not sure about drummers. I figure I’ll put the command figures where fusiliers of the 1st and 2nd companies would logically be. The Spanish are much simpler. For those 1811 battalions with elites there would be four grenadier figures on the right and four cazadores on the left. Some new battalions would not have elites. Regular regiments at the beginning of the Peninsular War had an entirely different battalion structure. One for a later post. The British battalions had 10 companies, eight centre companies, grenadiers and lights. So I’m going for two grenadier figures on the right and two lights on the left. I love it! It really annoys me to have to move 6-10 bases per unit. It just slows the game down unnecessarily. People argue they enjoy the ability to change from column to line and back and forth, yet I rarely see it done in games. You have inspired me to do the same. Great stuff Daniel. One of the reasons I decided on two bases per battalion as it does enable me to represent line, column and square. But without being fiddly, like other schemes. How do you represent assault column as opposed to march column. I know as soon as I base my French Battalions this way my gaming buddies will immediately complain about THAT! Ah, you have spotted the fatal flaw. I have an answer but it is aesthetically less pleasing. Have a look at my post on How to use Big Bases with Napoleon at War, Lasalle, and FoGN. So, Steven, how were Spanish companies arranged for early War of Independence (1808-1810)? Grenadiers on right and no light infantry? 1. Spanish line infantry of 1808 had 8 men per company (32 per battalion) trained as skirmishers. Admittedly these guys would not stand up to much pressure as this was about a third of what a French battalion would field at the time. This changed over time and official regulations of 1810 and 1811 created Cazadore companies in each battalion. Even the Grenadier battalions had a light company in 1810, at least officially. By 1811 at latest I suspect this was the norm in practice. 2. The Spanish had light infantry regiments. Fielded in half battalions of 600 men. I assume, if present, these skirmished; in contrast French Light Infantry Regiments behaved like elite Line Infantry so didn’t particularly add to the skirmish line. Sorry, that trigger a bit of a rant. The short answer is, a 1808 Spanish 1st Battalion would have a stand of Grenadiers and a stand of Fusiliers; Grenadiers on right. A 2nd or 3rd Battalion would have two stands of fusiliers. I understand your rant, given how the Spanish army is handled in non-Spanish historical documents and wargame rules! How many integral skirmishers did a British Line battalion have? I know they often relied on light regiments, rifles, and cazadores to skirmish with the French lights and drive them off. BTW, were the lights in a Spanish line company called Tiradores or something properly Spanish to distinguish them from the fusiliers and grenadiers? Not that I know of. They would be fusiliers or grenadiers (depending on their company of origin) with special training. I suspect the term “Tiradores” came into use when there were light companies in light regiments (both infantry and cavalry). But I’m guessing. As I am admittedly too lazy to try to go through all the excellent material you have here…do you have the same sort of diagrams for big base mounting of forces for the South American Wars of Liberation? The South American chaps are based like Spanish in the Peninsular. I notice that you do not label your bases. How do you keep track which unit is which in the heat of the battle? Do you use a roster of some sort? James, I considered putting visible prominent label onto the top of the stands but decided against. Instead I label the underside with the national flag and name of the unit that the figures represent. Just so I can remember in 30 years time. For my big Liberators games I use separate cardboard labels as my roster. These sit neatly behind the unit on table. Again they have the national flag and the name of the unit. The name might not be the same as the name on the label underneath e.g. when a unit stands in for another. Finally the label has the stats for the unit in the game system I happen to be using. You can see these, for example, in my March Attack game.